The purpose of the youth network is to bring together organisations that provide services to 12-24 year olds who reside in the Mount Alexander Shire. The networks facilitate sharing of resources and professional capacity building. The networks will also develop and implement their own action plans based on the agreed strategic priorities. 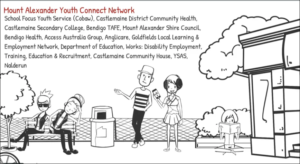 The membership consists of organisations that provide services within the Mount Alexander Shire and/or those that are committed to supporting young people. See Terms of Reference for a list of members. Click on image below to view the animation. Central Victorian Primary Care Partnership acknowledges the traditional owners on whose land we live and work, their rich culture and spiritual connection to country. We pay our respects to Elders past and present and celebrate their living culture and unique role in the life of our catchment. © 2014 Central Vic PCP. All Rights Reserved.